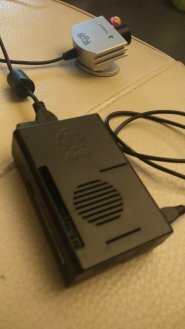 Kerberos.io is a cheap video surveillance system (the cheapest on the market I think) that you can install on a RaspberryPI and using it with an (old) USB camera, an IP camera or with the RPi camera. 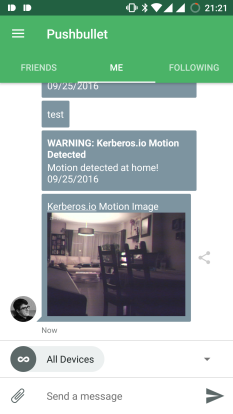 In Kerberos.io you can then configure different kinds of notification when a motion is detected. One of the available method is the WebHook and, using this configuration, I implemented an Hook project (extensible by plugins... WIP) which allow actually to have notifications on PushBullet. The information about the installation and configuration are available on the project README file. 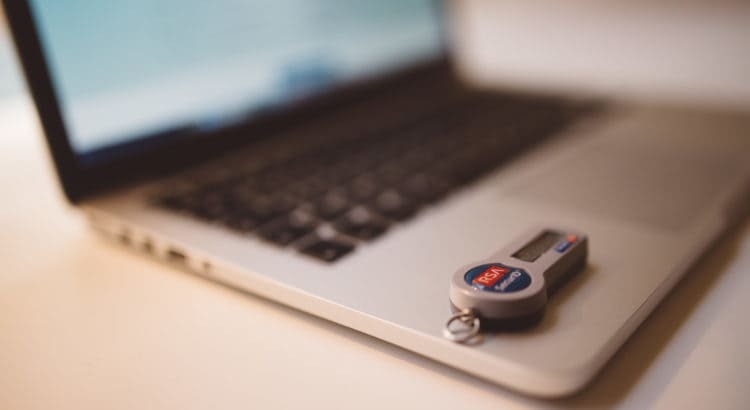 The result should be a Pushbullet message on all your linked devices, or on the device you selected to notify, with the image taken by the Kerberos.io camera. The plugin system of this project is already developed, and I planned to add other notifications like mail and TextMessage. Before I said it is WIP 'cause I'd like to improve this part forcing the way to develop the plugins with Interfaces and predefined functions. All is Open... if you test/use it and you have any comments improvements, don't hesitate to post comments (here or better on gitlab).